This is a spellbinding book. 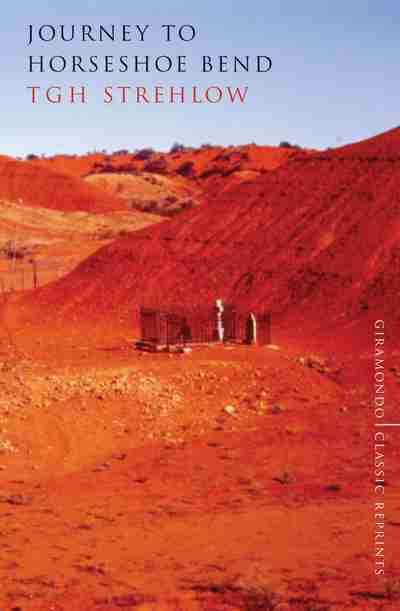 The arresting cover photo of a lonely grave in an arid vista of Australia’s Red Centre, gives some clue to the story within, but it also symbolises so much more. To our 21st century eyes, the grave with its Christian iconography seems incongruous: that land has been indigenous country since time immemorial. What is that grave doing there in that barren landscape? Journey to Horseshoe Bend is the astonishing tale of an epic journey taken by the Lutheran missionary Carl Strehlow in 1922. Travelling upright in a chair on the back of a horse-drawn buggy, and accompanied by his fourteen-year-old son Theo in a van drawn by donkeys, Strehlow and his wife Frieda Keysser struggled for twelve days in the relentless heat across the dry bed of the Finke River in Central Australia to get medical help. A doctor was driving up to Oodnadatta and they were hoping to meet up with him via Horseshoe Bend, 250km miles away from the mission at Hermannsburg (130-odd km southwest of Alice Springs). They never did reach help: after 28 years of devoted outback service in the most remote parts of the country, Carl Strehlow died at Horseshoe Bend, leaving his wife and child penniless and dependent on the goodwill of the Lutheran community and the stoic folk of the outback. Years later, T.G.H. (Theo a.k.a. Ted) Strehlow who was traumatised by these events from his boyhood, chronicled each day’s journey across the unforgiving landscape. There are four elements to his story: the journey with all its trials and tribulations; the history of the pastoral industry and the mission at Hermannsburg; Aboriginal myths and legends about the landscape over which they move; and Biblical stories, notably the story of Job, who was chosen by the Old Testament God to suffer innumerable sufferings as a test of his faith. As the reader follows the trail, the narration becomes more and more engaging, because none of it can be taken at face value. T.G.H. has an axe to grind against the Lutherans that (he thought) had failed to help and could have saved his father’s life; he makes dubious claims that the local Aranda (Arrente/Arrarnta) people had given his father sacred knowledge usually given only to the initiated; and he offers an account of his father’s innermost religious doubts and fears, which he could not possibly have known. And although he is honest about massacres of the indigenous people, and admits to the widespread practice of child removal when white men fathered daughters to indigenous women who they used as of right, T.G.H. has a Eurocentric view of missionary activity and dispossession, believing that development of indigenous land was appropriate and that spreading a foreign religion was God’s work. Despite – or perhaps because of – these flaws, this classic of Australian literary history is utterly compelling to read. Strehlow was due to return to Germany, to be reunited with his four older sons and a daughter who had been at school there for over a decade. But – perhaps because of hubris – he delayed his return until a suitable replacement could be found. He did not have a high opinion of his Lutheran brethren, and he was held in high regard by the indigenous people, among whom he was known as the ‘ajua’ (old man of importance or ‘ingkata’ (ceremonial chief). According to the Afterword by Phillip Jones, he had rescued the mission from a disorganised shambles; instilled durable Christian faith; and completed an extraordinary work of scholarship about the Arrernte and Luritja peoples. (p.293) Strehlow had also put a stop to police massacres in revenge for indigenous cattle spearings, and although for religious reasons he did not allow indigenous ceremonies on mission land he was tolerant of their religious beliefs, and he paid them the respect of learning their language and used it to deliver his sermons. So he was not going to hand over his legacy to anyone who didn’t meet his standards. The suffering of this man as he made his way towards hope of help was appalling. Could not God at least have spared him unseasonably hot weather? asks Theo, as he tries to reconcile the story of Job with the sufferings of his father. There are three heroes of this story: Mrs Ruby Elliot, who rode seventy miles in twenty four hours over rough country without taking a rest; her husband Gus Elliot who offered to race down eighty miles in a buggy to Charlotte Waters in less than a day and a half, pick up the doctor on his arrival, and then turn around without a break in order to speed back in the same space of time or even less; and Ezekiel’s marathon walk to Alice Springs. There were also the drivers of the van and the buggy, plodding along in temperatures well over the century, and many readers will find it painful to read of the sufferings of the animals along the route as well. While T.G.H. is under no illusions about the way bushmen treated the indigenous people, especially women, he contrasts the way that the uneducated, a-religious men and women of the outback always looked out for each other, against the cant of the Lutherans far from the remote missions, who did nothing to help their loyal servant. Philip Jones in the afterword refutes this accusation, and suggests that T.G.H. elevated the conduct of the bush folk in order to shame the mean-spirited Lutherans who caused his father’s death. Whatever the truth of it, it is clear that T.G.H. felt that his father was paid the respect he deserved by the men who attended the inevitable wake in the Horseshoe Bend Hotel. The book initially gives the impression of being a non-fictional account but the narrative perspectives and the mythical elements suggest otherwise. Is it a novel? In the program notes to Journey to Horseshoe Bend, a cantata for actors, singers, choruses and orchestra, composers Andrew Schultz and Gordon Kalton Williams refer to it as the ‘novel’ which inspired their work, but they praise it as a story of the promise of two cultures intermixing. T.G.H.’s story is bookended by excerpts of hymns by Bach that were sung by the Aranda people at Strehlow’s departure and at the funeral. In his retellings of Aranda creation myths as the party makes its way towards Strehlow’s doom, T.G.H. seems to give equal status to indigenous religion and his own Christian faith. In the end, the genre of the book doesn’t matter. It’s a magnificent piece of classic literature, and Giramondo Publishing are to be congratulated on republishing it after it has been out of print for almost forty years. PS This title is one of a series of Giramondo Classic Reprints. #SomethingToLookForwardTo In July they are bringing out Landscape with Landscape by Gerald Murnane as part of the same series. Available from Fishpond: Journey to Horseshoe Bend, direct from Giramondo or good bookshops everywhere. I find myself drawn to books about the early Australian occupation. The UWA used Strehlow’s “Songs of Central Australia” as a reference text (even though no one could get access to it because of its rarity) in the Coursera course – Australia – A Rough Guide. I didn’t realise this book had been republished – now I have to find a copy! I was very lucky this morning as I found a copy of Eleanor Dark’s A Timeless Land in an opp shop for $1! I’ve heard about the problems with Songs of Central Australia, something to do with indigenous custodianship and ‘ownership’ of the stories, I think. Ah that makes sense. We all thought it was a bit strange that they would pick that book considering the large number of other texts available – not very practical for a course that was available on an international stage. Have to say, that was the only criticism I had of the course – it was very worthwhile and brought a number of excellent authors to my attention. Coursera is a type of MOOC, is it? I did one about the English Country House in literature, and it was great until a hip young lecturer got her oar in and digressed into dopey popular culture using Merchant Ivory films instead of books, and the whole thing degenerated into discussing inane topics. It’s amazing, isn’t it, what we can do online! It’s become a very small world. I run a facebook page for our farming business and I receive “likes” from as far afield as Germany and America! We debate all the time the amount of fiction in histories. Particularly as film overtakes writing as the principal (popular) medium for conveying history, with all the condensing that implies, we are going to have to accept a certain level of imagination. Historical figures will become more and more like Odysseus or Robin Hood, pegs to hang a story on. Funny you should say that… I’m just reading Alain de Botton’s How Proust Can Change Your Life and he talks about how media condenses everything so that we fail to notice things. He was talking about newspapers, not films, but I think the same principle applies. But there is so much to love about JTHB: it’s a coming-of-age story; it’s an older-but-only-in-some-ways wiser man looking back; and parts of it show the effects of becoming embittered so the reader is aware of the passage of a man’s lifetime. But the descriptions of the landscape; the ancient Aboriginal myths and the Biblical references bring a sense of timelessness as well. I think this book shows how historical figures can be distorted by ‘condensation’. If you look at Strehlow’s Wikipedia entry, he is a cardboard figure, of no interest to me at all. I look at the photos of Carl Strehlow in his prime on that website and see him as a strong, powerful man, sure of the righteousness of his mission and all that, and I think I would be sure to dislike him as I dislike all proselytisers. But in my mind – because that is how his son has portrayed him – he is a tragic old man trapped in a failing body, making an epic journey, wracked by religious doubt and sustained only by a grim determination. Which is the real one? Literature for me is all about the exploration of character, not necessarily likeable! The storyline is to help us see more about the character. Anyway, excellent review, and onto the TBR goes JTHB. When I read the title of your post, I expected a book set in Arizona. So the content of your post came as a surprise. What a horrible story. Very educational to me, again. Oh, no, Emma, it’s not horrible. It’s a triumph of the human spirit!